Special is generally less useful than normal': this statement sums up Jasper Morrison's guiding principle for creating designs that are not extraordinary but rather 'super normal' and - just like HAL - that show deference to the dictates of daily life. With HAL, he has reinterpreted the multifunctional shell chair and created a versatile family of chairs with a clean contemporary look. 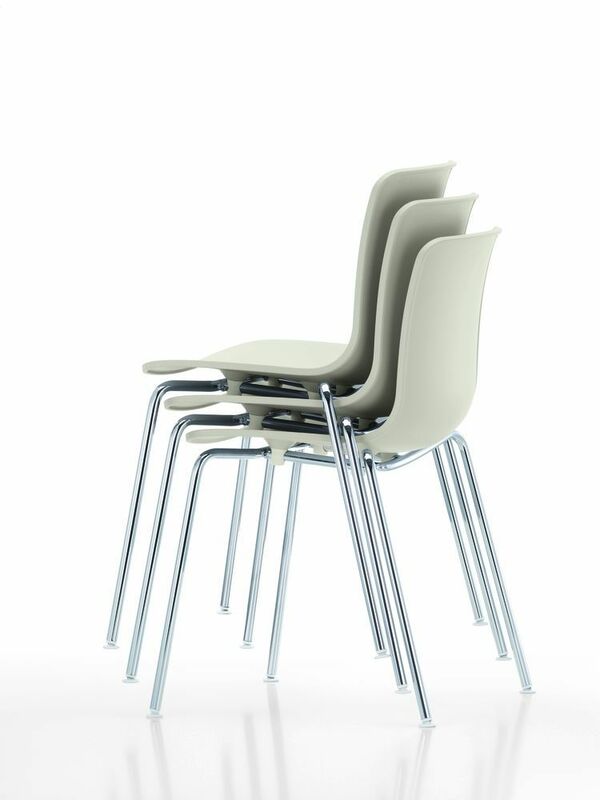 The shape of the seat shell provides great freedom of movement in a variety of sitting positions - even sideways or astride the chair. The related HAL Armchair rounds out the HAL family.The HAL Tube stackable armchair with a 04 white plastic shell and limited edition ivory base is part of the "White Collection" and "Home Stories for Spring 2016". Colour matched to the small attachment parts for the seat shell, choice of 04 white or basic dark. All bases are fitted with 04 Glides for carpet; felt glides optionally available for hard floors. Stacking four-legged base of chromed, tubular steel. Up to 6 chairs can be stacked on the floor, up to 15 chairs on the stacking trolley.